In competition for the Palme d’Or and one of the most anticipated American entries of the 65th Cannes Film Festival, Andrew Dominik returns with Killing Them Softly (2012), a sharp, noirish thriller which gave an already rain-soaked Cannes a slick masterclass in how genre movies should be done. Adapted by Dominik from George V. Higgins’ novel Cogan’s Trade and updated to the time of the 2008 financial crisis, the film is set within a criminal underworld of junkies, hitmen and mobsters, all feeling the pinch just like the rest of us. A pair of small-time crooks (Scoot McNairy and Ben Mendelsohn) decide to take down a mob-run poker game with a foolproof plan to escape retribution. Enter Jackie Cogan (Brad Pitt), the enforcer called up to find the stick-up men and see justice done. Cogan wants to keep his own involvement to a minimum, explaining to the gang’s middleman (Richard Jenkins) that he finds killing embarrassing. If it needs to be done, he will do it as softly as possible. Cogan hires Mickie (James Gandolfini) to assist, but things never seem to go as planned – in fact, the world seems to be going to hell in a handcart. With the banks collapsing, litter blows through empty streets (the book is set in Boston, the film was shot in New Orleans) past dive bars and closed businesses. The mob itself has become an invisible committee with a corporate mentality, represented by Jenkins’ go-between. Cogan is at once a representative of the ‘old world’ – his predecessor Dillon (Sam Shepherd in a blink-and-you’ll-miss-it cameo) is sick and possibly dying, but a survivor and a savvy operator in the new. Dillon is a clear-sighted, disciplined but highly cynical force who at the same time sees what has to be done in order to prosper. He sees himself as a man doing a dirty job, as nicely as possible. Dominik allows his ensemble cast plenty of space to roam, and Killing Them Softly is full of small stories and spoken scenes, the dialogue kept whip smart and snappy. In the press conference that followed, Dominik spoke of how the film was actually a kind of screw-ball comedy of sorts, and there is certainly a lot of humour throughout. The sporadic violence, when it comes, is both stylishly played and occasionally brutally realistic – yet although this is a violent world, no one seems to relish it and there are always consequences. 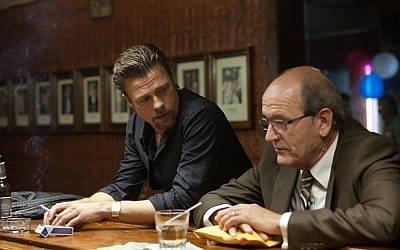 Pitt is at his very best here, investing Cogan with a calm believability and assured charisma. “I don’t know you,” a character says to him. “Not many people do,” comes the reply. It’s a nuanced and generous performance, during which he spends a lot of time listening to other people, and Dominik seems to have cut out any fat – no love interest, no private life as such, and not a cliché in sight. Killing Them Softly is as lean and disciplined as Cogan himself. It thumps along to a brilliant soundtrack and delivers a hard, cynical portrait of a society flailing in toward the abyss. “America is not a country,” Cogan explains, “It’s a business”; and a struggling one at that.